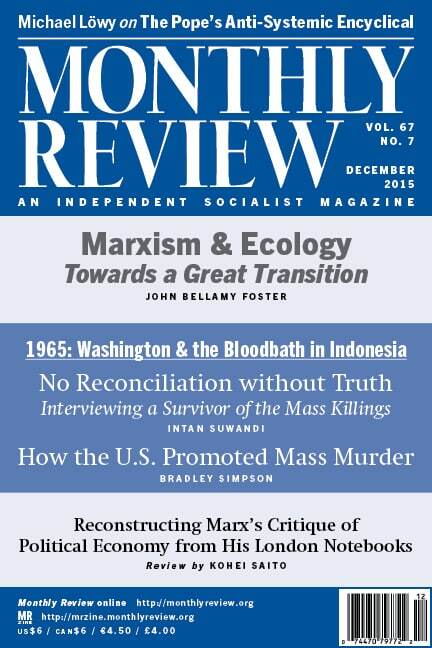 In this issue we feature two articles on the 1965–1966 mass killings and imprisonments in Indonesia. The army-led bloodbath was aimed at the near-total extermination of members of the Indonesian Communist Party (PKI), then a highly successful electoral party with a membership in the millions. The organized killing, in the words of Noam Chomsky and Edward S. Herman in The Washington Connection and Third World Fascism, constituted “one of the most extensive and brutal slaughters in human history.” In all, an estimated 500,000 to a million (or more) people were murdered. Another 750,000 to a million-and-a-half people were imprisoned, many of whom were tortured. Untold thousands died in prison. Only around 800 people were given a trial—most brought before military tribunals that summarily condemned them to death (Noam Chomsky and Edward S. Herman, The Washington Connection and Third World Fascism [Montreal: Black Rose Books, 1979], 205–17). The United States—as declassified documents later confirmed, and as Bradley Simpson explains in detail in his analysis, reprinted here—was involved clandestinely in nearly every part of this mass extermination: compiling lists of individuals to be killed; dispatching military equipment specifically designated to aid the known perpetrators of the bloodletting; offering organizational and logistical help; sending covert operatives to aid in the “cleansing”; and providing political backing to the killers. The new military government under General Suharto was greeted immediately as a major U.S. ally (see “C.I.A. Tie Asserted in Indonesia Purge,” New York Times, July 12, 1990; Gabriel Kolko, Confronting the Third World [New York: Pantheon, 1988], 173–85). 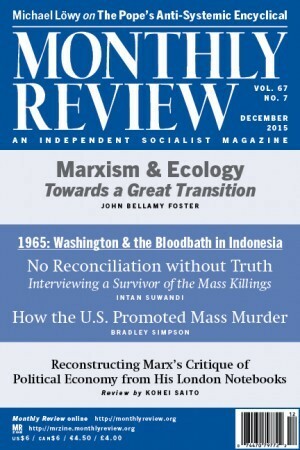 The Review of the Month in this issue, “Marxism and Ecology: Common Fonts of a Great Transition,” by MR editor John Bellamy Foster, was originally published online in October 2015 by the Great Transition Initiative at http://greattransition.org/publication/marxism-and-ecology. Published alongside it were a number of comments on the essay by David Barkin, Michael Brie, Hannah Holleman, Tim Jackson, Giorgos Kallis, Kent Klitgaard, Ashish Kothari, Fred Magdoff, and Rasigan Maharajh, together with a response by Foster. The Great Transition Initiative is an online forum and international network dedicated to promoting critical visions of a transition to enriched human development, collective solidarity, and ecological resilience. It has its origins in 1995 in the Great Scenario Group, which in 2002 released its important essay The Great Transition (see the discussion in John Bellamy Foster, The Ecological Revolution [New York: Monthly Review Press, 2009], 253–64). In 2003 the Great Scenario Group was transformed by the Tellus Institute into an international forum, formally constituting the Great Transition Initiative, now directed by Paul Raskin, with Jonathan Cohn as managing editor. It operates as an online journal as well as a transnational network, publishing a rolling series of invited essays on various conceptions of the Great Transition, together with commentaries on the essays, and reviews of important works. More information may be found at http://greattransition.org/about/aims-and-background. Rosalyn Baxandall, feminist activist, historian, and Monthly Review author, died on October 13, 2015. She was seventy-six. Baxandall played an important role in the early feminist movement in New York in the 1960s and was a member of New York Radical Women and Redstockings. As a professor of American Studies at the State University of New York at Old Westbury, she published, with Linda Gordon and Susan Reverby, the famous documentary history America’s Working Women. That same year Baxandall, along with Gordon and Elizabeth Ewen, contributed a classic article, “The Working Class Has Two Sexes,” for the special July-August 1976 issue of Monthly Review on “Technology, the Labor Process, and the Working Class.” Baxandall later wrote an important biography, Words on Fire, of Elizabeth Gurley Flynn. Her last written work was a book review, entitled “An Anti-Imperialist Feminist’s Tale,” for the September 2015 issue of MR. In that review she noted that “most of the great advances in women’s lives have come from the women’s liberation movement, not from women in the university.” Yet she observed that many women professors, such as Sara Evans, Linda Gordon, and Marlene Dixon, “were also activists in the women’s liberation movement. Their activism in the late 1960s and ’70s was essentially outside the university,” but they brought their knowledge and experience to bear on the struggles in which they were engaged. It was to this group of dedicated activists who were also professional educators, and who fought for women’s liberation in all that they did, that Baxandall was proud to belong. Peter Custers, author of the landmark Capital Accumulation and Women’s Labor in Asian Economies (Monthly Review Press, 2012) died at his home in the Netherlands on September 3, 2015. He was sixty-six. Custers was a major writer on political economy, imperialism, militarism, and peace. He was especially noted for his scholarship and activism in relation to South Asia. His book Questioning Globalized Militarism (Merlin Press, 2008, with a foreword by Samir Amin), was in the tradition of Marx’s Capital, Paul Baran and Paul Sweezy’s Monopoly Capital, and Amin’s Imperialism and Unequal Development. It introduced the key concept of “negative use value,” in relation to military goods in particular. His article “A Different Perspective on the U.S.-India Nuclear Deal” appeared in the September 2009 issue of MR.
Percy Brazil, a longtime director (together with his second wife Gladys Brazil) of the Monthly Review Foundation, died at age ninety on October 23, 2015. Brazil was born in Glasgow and attended medical school at the University of Glasgow before emigrating to New York, where he was to practice internal medicine and where, in the 1980s, he became president of the medical staff at Phelps Memorial Hospital. Brazil was very active in socialist circles and causes. He wrote two articles for MR, “Remembering Daniel Singer” (February 2001) and “A Man for All Seasons” on Carl Marzani (February 2005). He was proud of the political company he kept, writing in his piece on Marzani about his recently deceased friends Angus Cameron, Daniel Singer, and Paul Sweezy. Later he and Gladys would also write of their memories of Harry Magdoff for MRzine in “A Threnody for Harry” (January 1, 2007). In the case of all of these individuals, he stated, “what they had in common was a core which they all shared, and that core, the very essence of their being, is the soul of socialism.” Percy Brazil too was made in this mold.